The Martinů Voices vocal ensemble was founded in 2010. 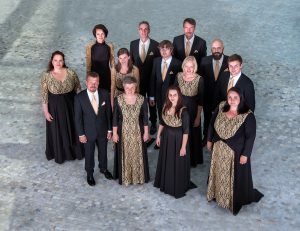 While its main artistic focus has been on top-quality interpretation of chamber choral works encompassing the time span from the 19th – 21st centuries, the choir´s repertoire also includes compositions from the Renaissance, Baroque and Classical periods. The ensemble is made up of professional singers working under the direction of conductor Lukáš Vasilek. The Martinů Voices appear regularly at the Czech Republic´s major music festivals including the Prague Spring, Dvořák Prague Festival, Strings of Autumn, Saint Wenceslas Music Fest, or Lípa Musica, among others. Apart from its own concert programmes which constitute the core of its creative endeavour, the choir has likewise been involved in a number of joint projects with this country´s orchestras and conductors. In 2014 it joined the Czech Philharmonic Orchestra and its principal conductor, the late Jiří Bělohlávek, in a production of Bohuslav Martinů´s opera Čím žijí lidé (“What Men Live by”). This particular collaboration earned them among other accolades a nomination for the prestigious International Opera Award (2015). Another major achievement for the Martinů Voices was their concert appearance alongside the prominent British ensemble, the Tallis Scholars, at the Dvořák Prague Festival in 2016. In the following year the choir joined forces with the Bang on a Can All Stars ensemble in the Czech premiere of the cantata Anthracite Fields by American composer Julia Wolfe (Strings of Autumn festival). The art of the Martinů Voices has been documented by several CD albums including most notably recordings of choral works by Jan Novák and Bohuslav Martinů, released by Supraphon in 2014 and 2018, respectively. The choir´s album with Bohuslav Martinů´s chamber choral cycles figures in the Editor´s Choice in the March 2018 issue of the prestigious British magazine Gramophone.